"To me the island is not an image that repeats itself every second. Each place has an image that changes every second... now we are here and it looks like this, in a half hour it will look different. "There is a game between the clouds and the sun and the winds and the rains that are always changing - and that is what attracts me to loving this island so much." Rapa Nui, Easter Island, Isle de Pascua... the Navel of the World. The first impression I had of the island was of the light - the sensation that the sun was shining through the air, not just lighting the landscape, but lighting the air and the sky as well. It's a fairly barren piece of land - a little bump of volcanic rock and ash that began forming 3 million years ago - exposed to the elements, the wind, rain, sun, sea, shaped by the scarce plant and animal life that found its way there by air or by sea. And further shaped by the presence of humans since the first Polynesians landed on the shores sometime around the 700's. 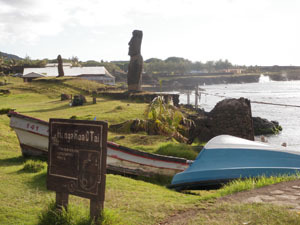 The story of the people of the island, the Rapa Nui, is astounding. A society that grew from a handful of people that had traveled by sea, over 2000 miles from the nearest inhabited land, bringing with them, by boat, everything they need to start anew - plants, animals, tools and survival knowledge laced tightly with cultural beliefs. When the first people landed, the island was covered with lush vegetation, 70% of the land covered by palm trees and other native tree species. 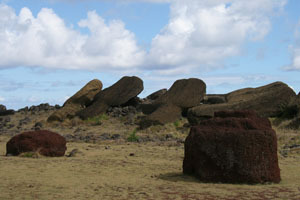 The island population peaked at around 14,000 people at the height of the Moai period. Twelve tribes across the island competed with each other for the diminishing resources, and the drive for dominance and prosperity among the tribes was most embodied by the obsession with erecting larger and grander Moia with each successive generation, appealing to the gods for protection of their villages and for the gift of life sustaining resources, and intimidating other tribes with their own displays of power. As the population grew, the food and resources became scarcer and the tribes waged war against each other - killing, cannibalizing, and destroying village structures... and the ultimate victory was in the toppling of the village Moia. These huge monolithic stone structures were pulled over, face down, as a symbol of victory. All of the Moia had been toppled by the mid 1800's. And every single tree on the island was eventually cut down - trees that were used to move the Moia statues from the quarry - Rano Raruke - where they were built, to the villages where they were erected. Trees, fibers for rope, human labor... all exploited in the quest for dominance, the obsession with appealing to the gods and honoring their tribal leaders. And the - desperation to survive on a tiny piece of earth where the human population outgrew the lands ability to sustain it. The people outgrew their 'planet' - they simply ran out of food and resources and as a consequence of their wars for dominance and survival, they destroyed everything that they once had. The 'discovery' of the island by Europeans was over a period of a couple centuries. 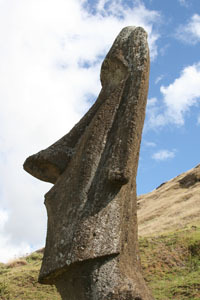 First sighted by a Dutch explorer in 1722 on Easter Sunday (thus Easter Island). A brief landing and skirmish and no reason to stay (no supplies available for restocking) saw the Dutch leave within a week. A Spanish expedition in 1770 found the island, planted a flag, claimed the island for Spain, and then left. Four years later Captain Cook came to the island. The crew were sick and desperate for fresh water and supplies, but the islanders were also desperate. The ship soon left. During the late 1800's Peruvian's were searching Polynesia for sources of slave labor (Peru had abolished slavery by then). 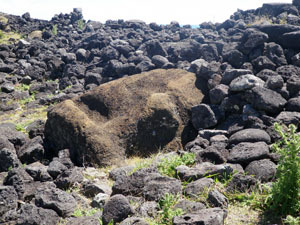 Rapa Nui was a prime 'source' of human slaves since it wasn't under the protection of another country (such as French Tahiti). Over 2000 people were taken forcibly from the island to work the mines in Peru. Most of the people died in transit. 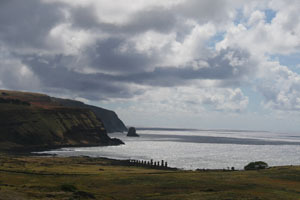 A handful were eventually returned to Rapa Nui, but they brought back diseases such as small pox, and the remaining island population was further decimated. By the end of the 19th century only 111 native people survived. 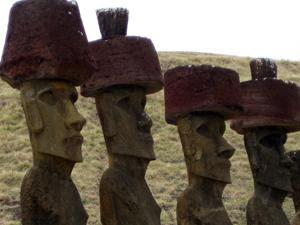 In 1883 Chile defeated Peru (and Bolivia) in the war of the Pacific, and Easter Island - Rapa Nui - was ceded to Chile. It was officially anexed. 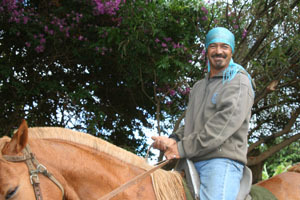 Chile had little interest in the island, there were no valuable resources, and in the early 1900's a Scottish/Chilean sheep and nitrate company, the Easter Island Exploitation Company, came to the island with the intent to raise sheep on the (now treeless) grasslands. The company herded all of the natives to the small harbor town, Hanga Roa, and kept them enclosed in the area by barbed wire perimeter fencing. Some of the older Rapa Nui still remember this time which lasted for generations, when they could not venture out on their own island. 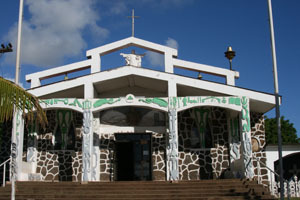 Today Rapa Nui is still a 'special territory' of Chile, sharing currency, language and some governmental authorities, but also has a degree of autonomy. 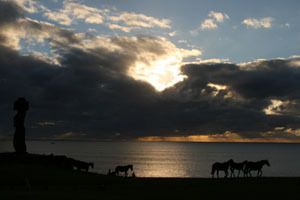 Today only native Rapa Nui are allowed to own land, any outside development must be done through lease and contract, and the Rapa Nui are resentful and suspicious of outside influence. Tourism is becoming a major industry on the island (there is really no other significant industry) and the people want to keep as much control over this as possible. 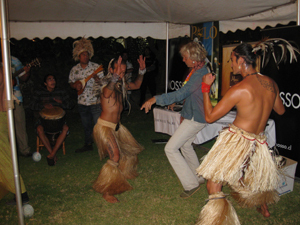 It is a very interesting place - a cultural mix of Polynesian and Spanish - food, language, culture - a desire to protect the native cultures and language, and a need to embrace the modern world for survival.